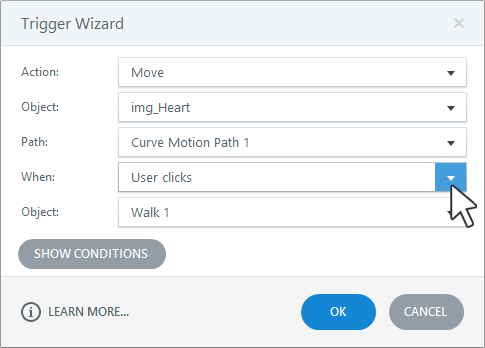 When you add a motion path animation to an object, a trigger will automatically be added to the Triggers panel for the motion path. It defaults to triggering the motion path when the timeline of the object starts, but you can change it. 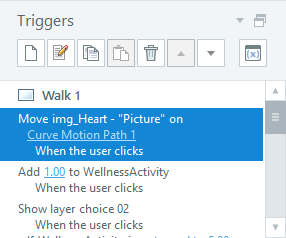 It's easy to trigger a motion path when learners perform a certain action. Just double-click the Move trigger in the Triggers panel to open it for editing, then adjust the parameters of the trigger. For example, let's say you want the motion path to occur when learners click an object. You'd change the When parameter to User clicks. Other examples might include triggering the motion path when the state of an object is visited or when the value of a variable changes. If you need help editing triggers, see this tutorial. Double-click the Move trigger in the Triggers panel to open it for editing. Time: Choose this option to trigger your motion path at a specific time, then enter the exact time in seconds. Cue point: Choose this option to trigger your motion path when the timeline reaches a specific cue point, then select an existing cue point. Click OK to save your changes and close the Trigger Wizard. 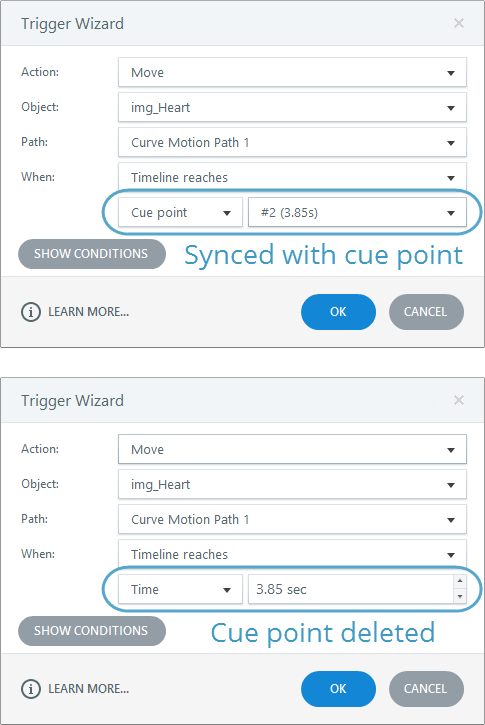 Tip: If you sync a motion path with a cue point and later move the cue point to a different time, the motion path will also move to the new time. In other words, it'll remain synchronized with the cue point you selected no matter when the cue point occurs. On the other hand, if you delete the cue point, your motion path will remain intact, and it'll occur at the point on the timeline where the cue point was when it was deleted.